Mini-greenhouse is an excellent additional tool for growing sprouts and low plants, for example, pumpkins, cucumbers, watermelons, salads, dill, etc. 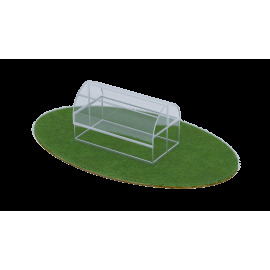 If necessary, the mini-greenhouse can be easily moved and installed in another place. It can be easily opened and closed. During manufacturing process a 4mm thick polycarbonate is used for cover that increases heat insulation of the greenhouse and allows the mini-greenhouse to withstand large snow loads.